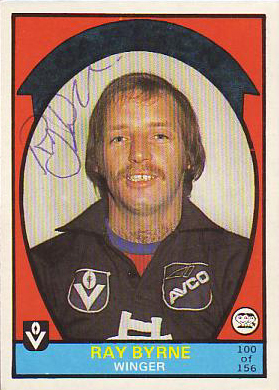 Ray Byrne will be remembered as one of the most unfortunate players in the history of VFL/AFL football. A capable and courageous defender, he turned out for two clubs in four Grand Finals - only to be on the losing side in each one of them. In 1972, Byrne was recruited by the Blues at the age of 19 from Golden Square, in Carlton's rich Bendigo League zone. He was given guernsey number 26 and soon proved to be a popular clubman and a creative wingman and half-back flanker. At 181 cm and 80 kg, he was equally at home on the last line of defence, where he played in Carlton's 1973 Grand Final loss to Richmond. The Blues went down by five goals that day, but Byrne's opponent; Noel Carter, was hardly sighted on the day. Although his endeavour rarely faltered, by 1978 Byrne's opportunities were drying up - due mainly to the emergence of future stars like Peter McConville, Rod Austin and Wayne Harmes. That same year there was an upheaval at the club with coach Ian Stewart resigning because of poor health, and then Serge Silvagni and later Alex Jesaulenko taking turns as senior coach. It was around that time that the Blues offloaded Byrne's good mate Robert Walls, to Fitzroy - so Byrne decided that he too wanted out. As he put it, "I didn't like the scene at the time, and up until the Wednesday before clearances closed they weren't going to let me go. And then at the last minute, the Blues got a deal they wanted. They gave permission for me to go to Collingwood on the proviso that they got a form four". (A form four was required for every player recruited to a VFL club). Byrne wasn't keen to go to Collingwood - he actually wanted to join Melbourne - but at the last minute he was off to Victoria Park. Incidentally, the Blues recruited Robbert Klomp with the form four they received in exchange from the Magpies. So, after 81 games and 13 goals for Carlton in six seasons, he found himself at Victoria Park, where he quickly established himself in Collingwood's lineup. He went on to play 121 games and boot 10 goals in black and white, including three consecutive losing Grand Finals - to Carlton in 1979, Richmond in 1980 and Carlton again in '81. Byrne can remember his first night at Collingwood especially well, as he wore a Carlton jumper out onto the track, and as he recalled, "got a few dirty looks". In round 19 of the '83 season, Collingwood met Richmond at the MCG in Richmond champion Kevin Bartlett's 400th AFL/VFL game. His opponent that afternoon was Ray Byrne. As the teams lined up for the first bounce, Byrne reached down into his sock, stood up, and presented the balding Tiger star with a toothless comb! Bartlett was amused, but not distracted, and Richmond won convincingly. In 1984, Byrne felt his time was up at Collingwood and asked for a clearance to Geelong. The 'Pies concurred and, at the age of 32, Ray played another 17 games with the Cats, before finally calling it quits after an impressive career. In 1977, Ray's twin brother Phil Byrne played four Reserves games for the Blues, and then returned to the Bendigo League. In other news from May 1973 Carlton players Ray Byrne and George Miller (Square) and Geelong defender Doug Carter (South) had returned to Bendigo footy. All three had played matches with their VFL clubs in the '73 season on permits. The trio had been regular members of their BFL clubs in 1972, a year earlier. But with the 'match-of-the-year' Square v South coming up early in the season (May 19th), the trio had decided to play Bendigo footy. It had been a tough decision for Byrne because his VFL club Carlton was scheduled to clash with arch-rivals Collingwood in the match-of-the-day. - Bendigo Advertiser, May 1973. In 1997 the Bendigo FL compiled their best team for players originating from the BFL VCFL zones for the period from 1972 - 1997, Byrne was named on the half-back flank in that team. Contributors to this page: Bombasheldon , Jarusa , molsey , PatsFitztrick , tmd1 , p(12)terg , WillowBlue , true_blue24 and admin . Page last modified on Sunday 03 of March, 2019 17:26:52 AEDT by Bombasheldon. 1987 - Bears eye off Blues (02/09/87).